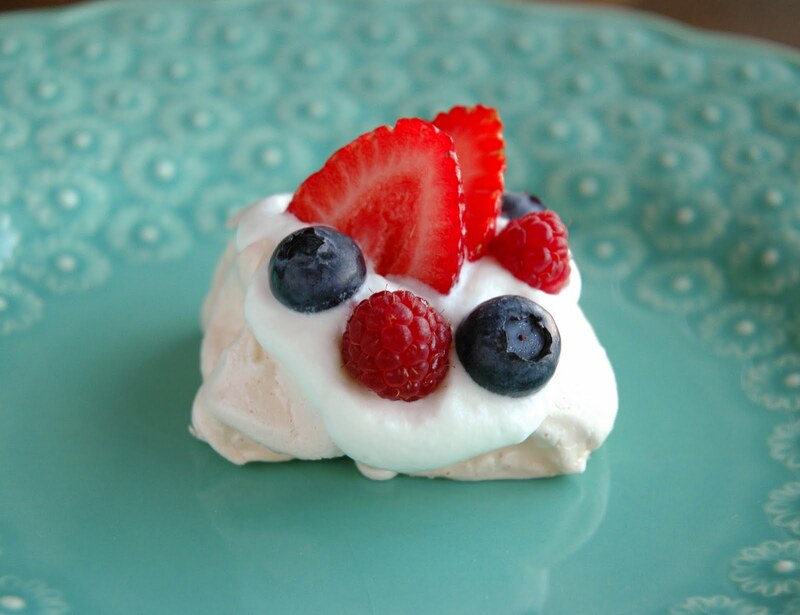 One of my very favorite desserts came from a friend from New Zealand that I met in graduate school: the pavlova. 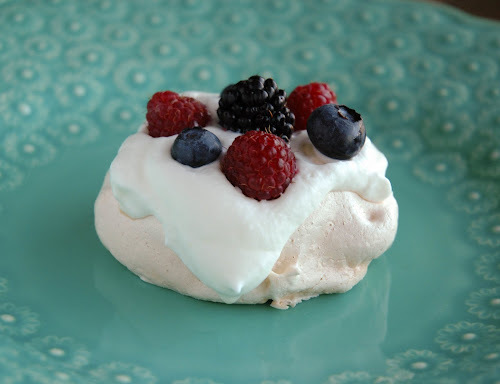 Pavlova is a wonderful sweetened and baked meringue made mostly with whipped egg whites and sugar and a little bit of vanilla, vinegar, and cornstarch. It's named after Russian ballet dancer, Anna Pavlova. It’s usually topped with whipped cream and fresh fruits. This lovely crunchy yet delicate dessert looks stunning but doesn’t really cut cleanly. I thought a miniature version might be easier to eat. Following this recipe, I separated the egg whites from the yolks and whipped them into glossy, stiff peaks with the salt and sugar. Folding in the cornstarch, vanilla and vinegar, I made 24 mounds of glorious meringue- with flattened tops- and slowly baked them first at 325 for an hour and 15 minutes (they were browned but still moist inside) and then in an extinguished oven for another hour or so until they were crispy on the outside and chewy-dry inside. 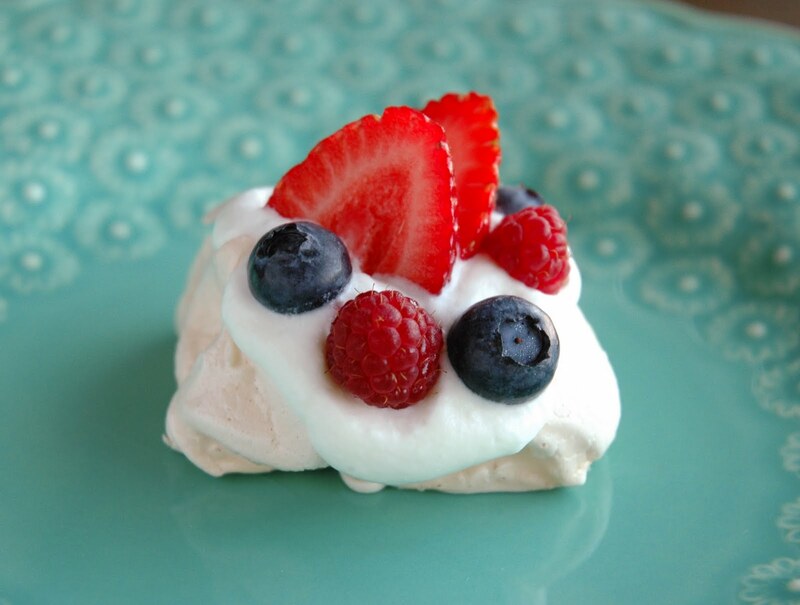 The beauty of the mini-pavlova is that I could check one to see if it was done without ruining all of them. Finally, when dry enough, I topped them with fresh whipped cream and berries. The flattened ones had a better surface to do this. I originally used a whipper that I filled with cream but I didn’t get the gas: liquid right. It collapsed. 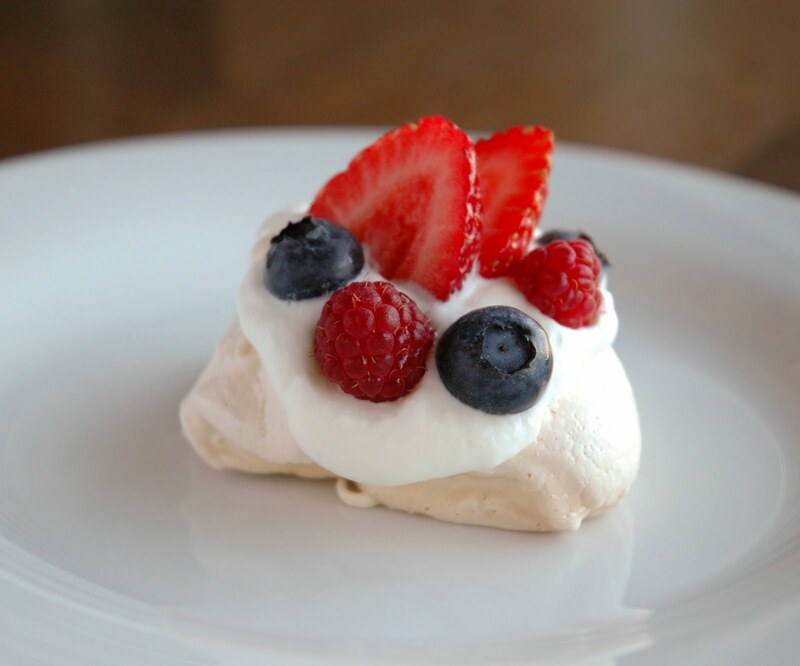 The pavlova looked much better with dollops of whipped cream from the mixer than with ridges. Mint would also be a lovely accent to these as well. I've made a full sized one and it was beautiful, but as you pointed out, hard to cut and serve. I may have to try the miniature version! Great idea! Glad you like the idea, Claire! 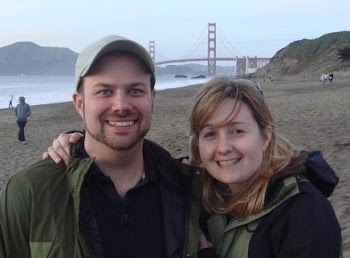 And thanks, Nicola for helping me finally figure out how to make the photos big! !